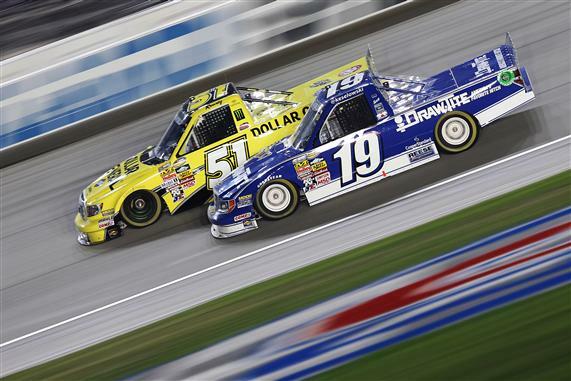 JOLIET, Ill.–If Kyle Busch has found a little extra speed he can use down the road in NASCAR’s Camping World Truck Series, second place might be the best his rivals can hope for. Busch held off Brad Keselowski in the closing laps of Friday night’s EnjoyIllinois.com 225 at Chicagoland Speedway to win for the 34th time in the series, frustrating Keselowksi’s bid to become the 24th driver to win in all three of NASCAR’s national series. “We didn’t have the speed on the short run, but on the long runs, we had a really, really good truck,” Busch said. “It’s been fun. It’s a great win for this team. This team really deserves. (Crew chief) Rudy (Fugle) and the guys have worked really hard. Busch won for the fourth time this season, the third time at Chicagoland and the 34th time in his career. Keselowski finished second for the fifth time in 58 starts. Ryan Blaney who drives for the team Keselowski owns, ran third, followed Matt Crafton, who extended his series lead to 41 points over eighth-place finisher James Buescher. Ty Dillon came home fifth. Keselowski and Busch waged a scintillating battle during the last half of the 150-lap race, trading the lead multiple times before Busch took the point on Lap 130. Busch held the top spot and opened an advantage that reached nearly one second before Keselowski began to close with 10 laps left. By Lap 143, Keselowski had pulled within a truck-length of the No. 51 Toyota, but Busch kept his rival at bay by running the high line around the 1.5-mile speedway. “It’s not a lot of fun,” Keselowski said of his fifth second-place run, “but this is the most fun you can have finishing second. We’ve been right there. This particular race, second was probably where I deserved to finish on that last run. After getting loose and falling back in traffic on Lap 59, Keselowski brushed the wall while racing in close quarters with Ty Dillon. “I knew I had gotten there pretty late,” said Keselowski, who had a strong run to the outside of Dillon’s No. 3 Chevrolet. “Obviously, I could have stayed in it and wrecked both of us. And then we made slight contact. Notes: Busch led 52 laps to Keselowski’s 50… Crafton posted his 16th top 10 in 16 starts this season… Keselowski has finished second to five different drivers in the Truck Series: Kevin Harvick, Justin Lofton, Buescher, Ty Dillon and Busch. 1. (7) Kyle Busch(i), Toyota, 150, $41610. 2. (11) Brad Keselowski(i), Ford, 150, $34925. 3. (15) Ryan Blaney #, Ford, 150, $25370. 4. (8) Matt Crafton, Toyota, 150, $18985. 5. (2) Ty Dillon, Chevrolet, 150, $16010. 6. (16) John Wes Townley, Toyota, 150, $14585. 7. (10) Austin Dillon(i), Chevrolet, 150, $12185. 8. (9) James Buescher, Chevrolet, 150, $15360. 9. (1) Jeb Burton #, Chevrolet, 150, $16585. 10. (14) Johnny Sauter, Toyota, 150, $15510. 11. (13) Darrell Wallace Jr. #, Toyota, 150, $14135. 12. (3) Miguel Paludo, Chevrolet, 150, $14010. 13. (17) Ron Hornaday Jr., Chevrolet, 150, $13985. 14. (23) German Quiroga #, Toyota, 150, $13935. 15. (4) Justin Lofton, Chevrolet, 150, $14960. 16. (12) Ben Kennedy, Chevrolet, 150, $11560. 17. (21) Dakoda Armstrong, Chevrolet, 150, $13735. 18. (24) Jeff Agnew, Chevrolet, 150, $13685. 19. (20) Max Gresham, Chevrolet, 150, $13635. 20. (22) Kenny Wallace(i), Toyota, 149, $14185. 21. (26) Ryan Sieg, Chevrolet, 149, $13535. 22. (19) Tyler Young, Chevrolet, 149, $11260. 23. (6) Joey Coulter, Toyota, 148, $13485. 24. (25) Bryan Silas, Ford, 142, $12210. 25. (5) Brendan Gaughan, Chevrolet, 142, $12335. 26. (32) Jimmy Weller III, Toyota, Handling, 136, $11160. 27. (18) Timothy Peters, Toyota, Accident, 99, $11135. 28. (30) Jennifer Jo Cobb, RAM, 90, $11110. 29. (27) Scott Riggs(i), Chevrolet, Accident, 72, $11060. 30. (28) Justin Jennings, Chevrolet, Accident, 50, $11535. 31. (34) Mike Harmon(i), Chevrolet, Engine, 46, $11010. 32. (35) Norm Benning, Chevrolet, Axle, 21, $10960. 33. (33) Danny Efland(i), Chevrolet, Electrical, 18, $10935. 34. (31) JJ Yeley(i), Chevrolet, Vibration, 4, $10910. 35. (36) Chris Lafferty, Chevrolet, Rear End, 4, $10885. 36. (29) Chris Jones, Chevrolet, Transmission, 3, $10846. Average Speed of Race Winner: 124.195 mph. Time of Race: 1 Hrs, 48 Mins, 42 Secs. Margin of Victory: 0.338 Seconds. Lead Changes: 12 among 4 drivers. Lap Leaders: J. Burton # 1-42; B. Keselowski(i) 43-52; K. Busch(i) 53; B. Keselowski(i) 54; K. Busch(i) 55-60; R. Blaney # 61-66; K. Busch(i) 67-82; B. Keselowski(i) 83-103; K. Busch(i) 104-107; B. Keselowski(i) 108-121; K. Busch(i) 122; B. Keselowski(i) 123-126; K. Busch(i) 127-150. Leaders Summary (Driver, Times Lead, Laps Led): K. Busch(i) 6 times for 52 laps; B. Keselowski(i) 5 times for 50 laps; J. Burton # 1 time for 42 laps; R. Blaney # 1 time for 6 laps. Top 10 in Points: M. Crafton – 609; J. Buescher – 568; T. Dillon – 550; J. Burton # – 539; R. Blaney # – 527; M. Paludo – 526; T. Peters – 512; J. Sauter – 499; D. Wallace Jr. # – 498; B. Gaughan – 483.